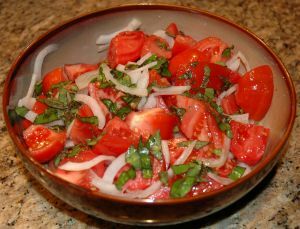 Paradicsomsaláta | Tomato Salad is a Hungarian food recipe mixed with onions, parsley and homemade dressing. Remove stem and core from the tomatoes with a sharp knife. Cut tomatoes into slices and place in a large bowl. Add onion and mix well. Mix vinegar, water, oil, salt and sugar into a jar, close tightly, and shake well. Pour dressing over tomatoes and refrigerate for 1 hour.